Search by Location, Guide, or Month! 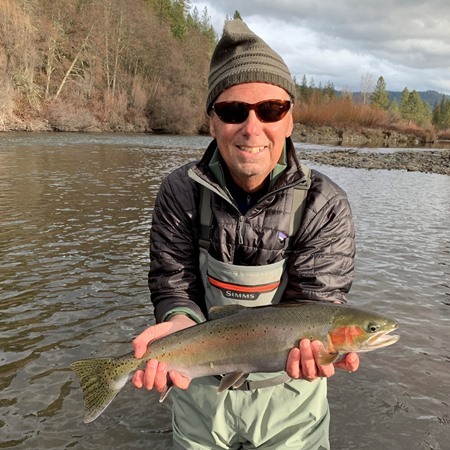 I spent the last three days guiding the Trinity for Winter Steelhead "On the Swing" and I would consider the fishing pretty good ! Early to mid January in my experience seems to yeild some of the best Winter Steelheading of the Season on the Trinity, we averaged a little better then 1 adult per day per angler, for Winter steelheading "on the swing" I would consider that good, the Steelhead on the Trin currenty are NOT spread out evenly from Lewiston to Pigeon Point, which makes me think that they are moving quite a bit right now, not necessarliy stacking up in a given area, "if your not finding em...move !" I had a great time today with Jason. 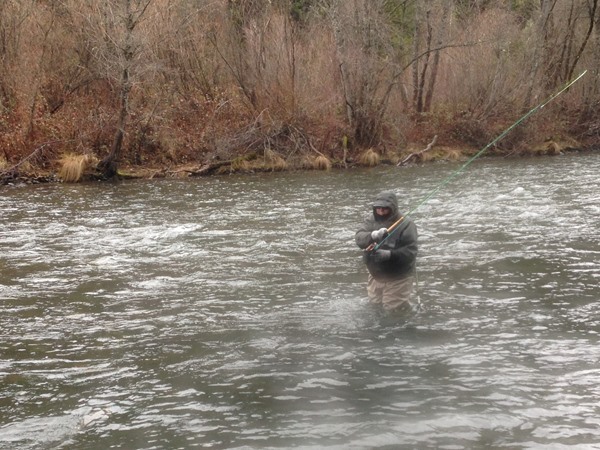 Our focus was swinging flies with the hopes of hooking into a healthy winter steelhead. Jason worked very hard and presented his fly perfectly, but unfortunately he was not rewarded for his efforts. We have a new storm headed our way, which should bring a new push of fish! Today was a great day with my guests Geza and Gina. The flows had dropped a bit and we had a few more boats to contend with, but we had a great day. Gina started it off hooking into a beast! She fought it for several minutes before landing a beautiful wild buck. Geza followed with a very nice hatchery adult. 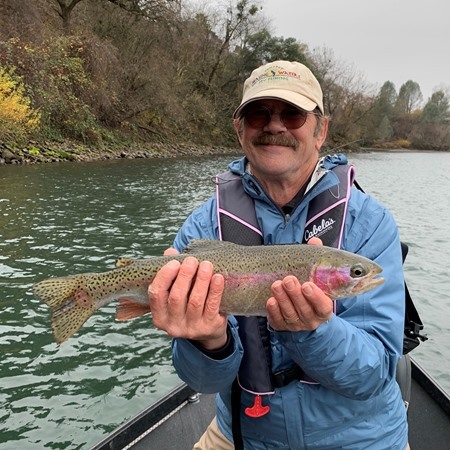 We landed several more nice hatchery fish and both landed a half-pounder each. This was their first time fishing the Trinity and I think they will leave with some great memories! View the Facebook Post for this Report! Nice way to start the day! 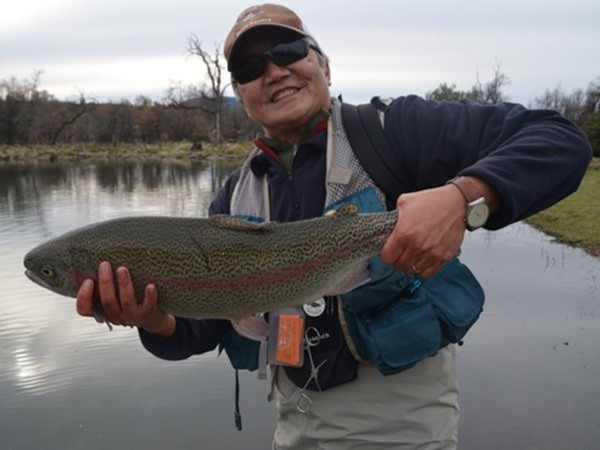 Geza with a beautiful steelhead! 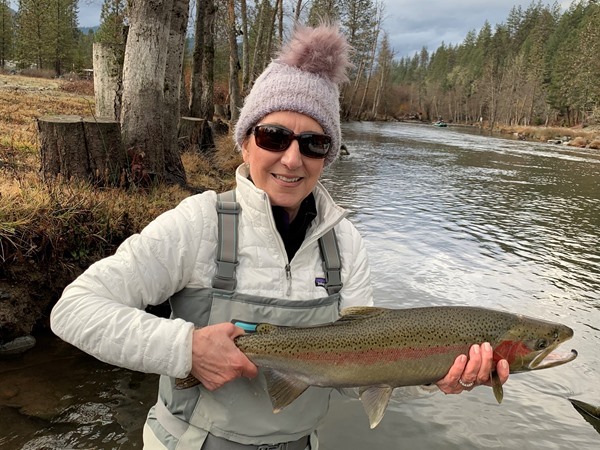 Gina with another really nice fish! 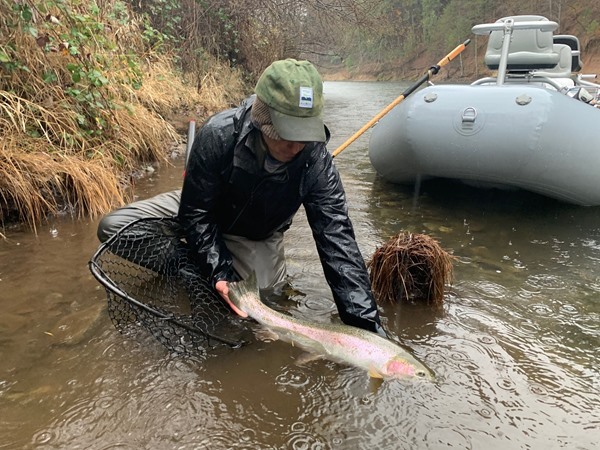 I had the pleasure of guiding Larry and Ginny on their very first steelhead adventure today. And what a first time experience they had! The flows were up from the previous two days of rain, but the color and clarity were perfect. 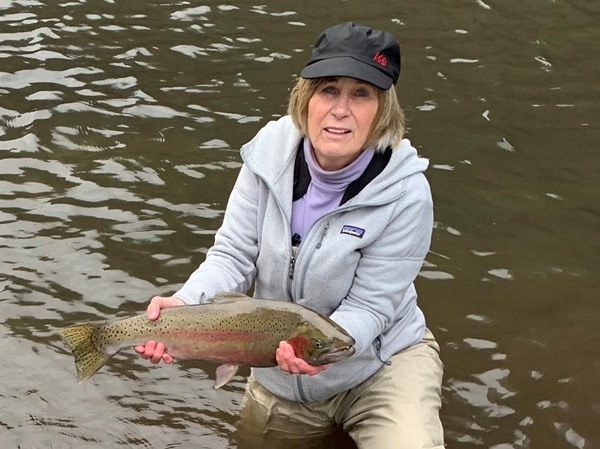 They both had several hook-ups throughout the day and Ginny landed a very nice hatchery buck. 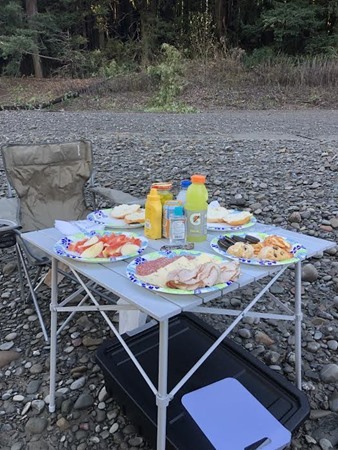 They were extremely pleased with their first steelhead experience. The extended forecast has several storms headed our way beginning Monday and lasting for about a week. This should help fill our lakes and reservoirs! This image doesn't show just how big this fish is! 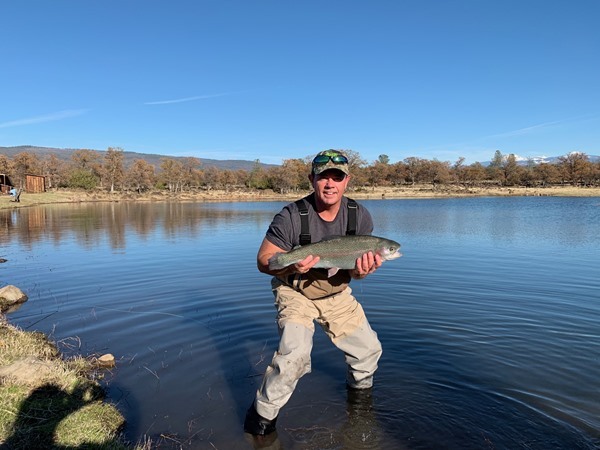 This write-up is from our guest Tony from Red Bluff who fished Eagle Canyon yesterday:"Thank you again for your hospitality. We really had the cards stacked against us yesterday. 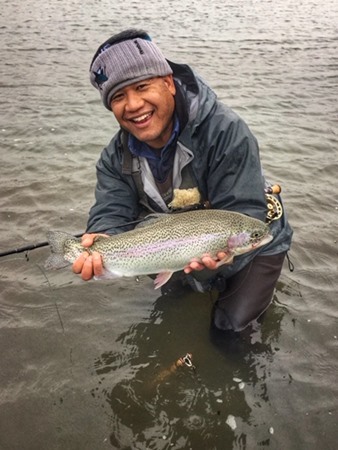 40 mph winds, all day freezing rain and 3 rookie anglers. We had a blast! Our group and the venue is so much fun. In spite of the conditions we still managed to have 35 hook ups and 20 fish landed. 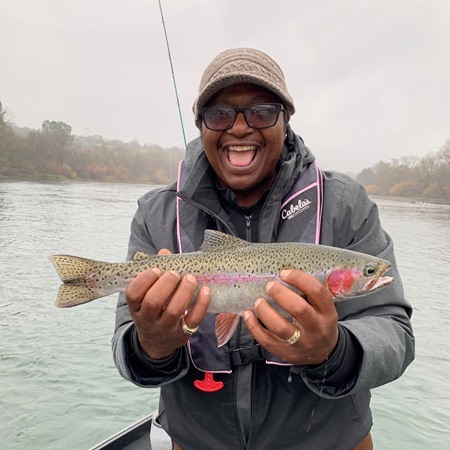 We caught fish throughout the day and they seemed to come in flurries. So if you weren't fishing you could miss your window for an epic hook up. You can quote me on this...these fish are tackle breakers. 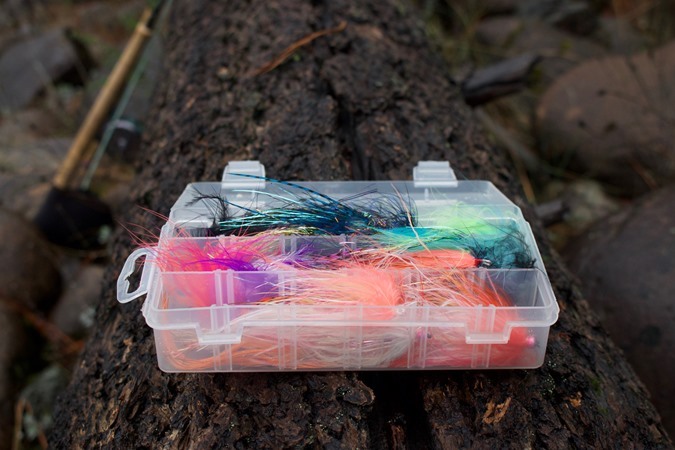 You had better have strong knots and quality tippet if you want to land these fish. We lost several fish due to slipped knots and faulty reel drag systems. 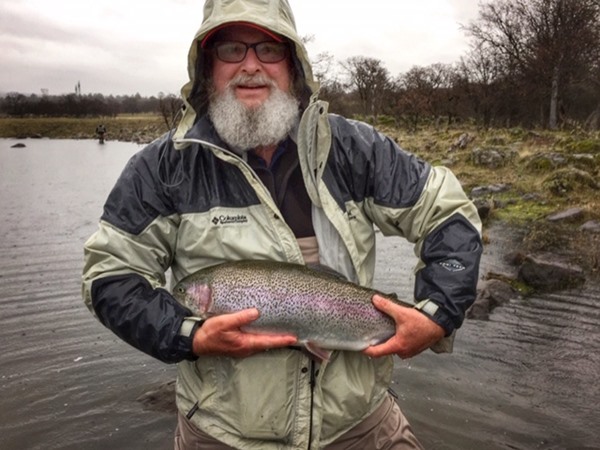 We caught fish using large size 4 streamers and small size 22 midges and everything in between. 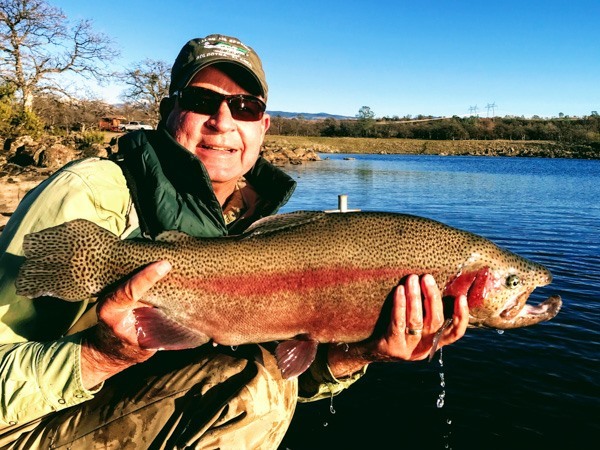 Eagle Canyon is a true fisherman's paradise. 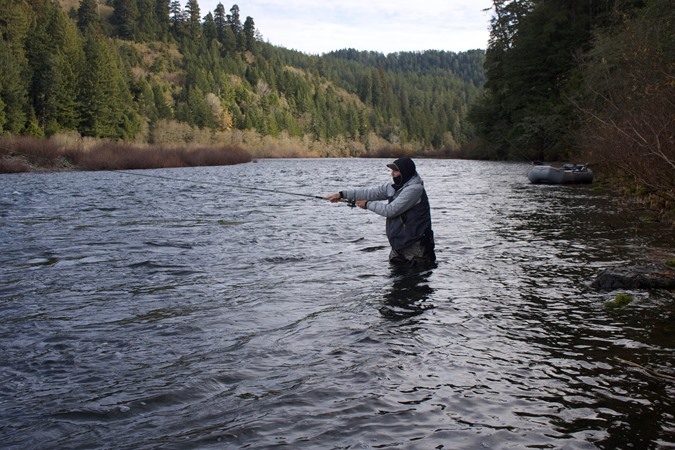 We are looking forward to fishing again with Confluence Outfitters. Thank you for making our fishing dreams a reality." I had another great day with Bob and Rich on the Trinity today. We dodged the rain and the river was in great shape after the weekend storms. The fish were on the job today. 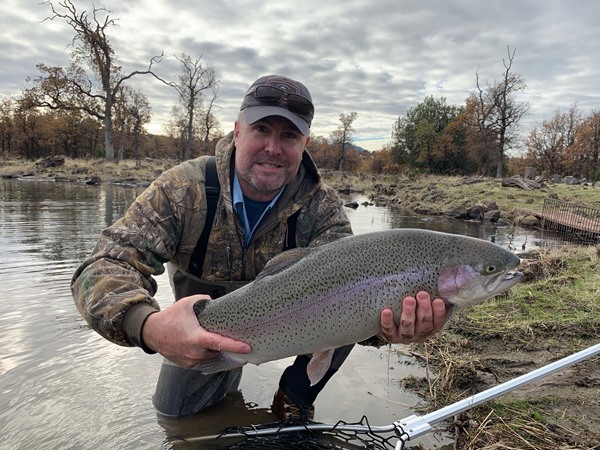 Rich ended up on the losing end of a few epic battles with some really nice fish and Bob landed a small adult. They have some fish stories to tell for sure, but it was a very good day with good friends. More rain is on the way this week and next. Fellow guide Kevin Kay and I found ourselves with a day off, so we decided to do some fishing. Conditions are tough right now - the water is low, cold, and very clear. We shared time on the oars, but in the end, we had only one encounter and it was my time to hold onto the cork – how sweet it is! We have a significant winter storm system headed our way beginning Saturday. 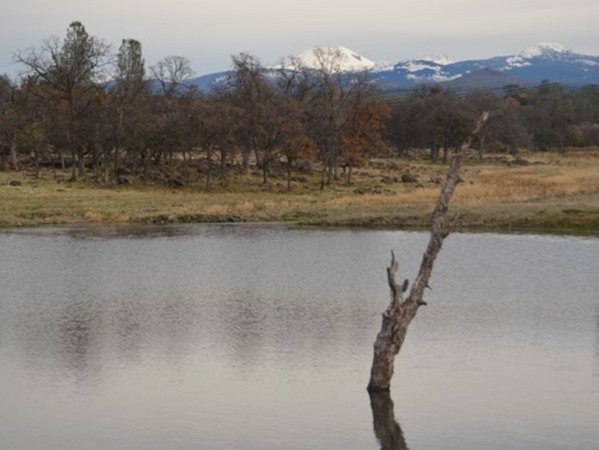 Snow is expected this weekend, and then another few days of rain. 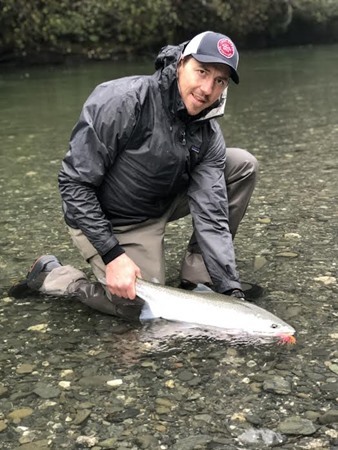 This rain is welcome and will hopefully bring more fish into the upper river! 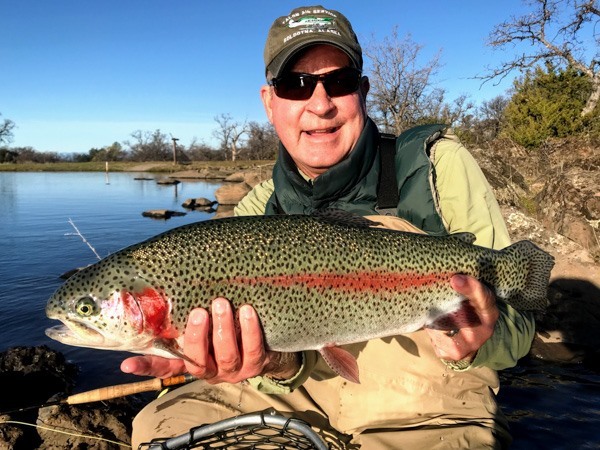 This report is from long-time guest Rocky who fished Eagle Canyon on New Year's Eve:"Great day on the ponds. One of my best (And I’ve fished it a lot.) Beautiful day and the wind probably helped us. Somewhere around 50-60 hookups between the two of us and landed about half of those." I just finished up a two day swing trip with Patrick on the North Coast. 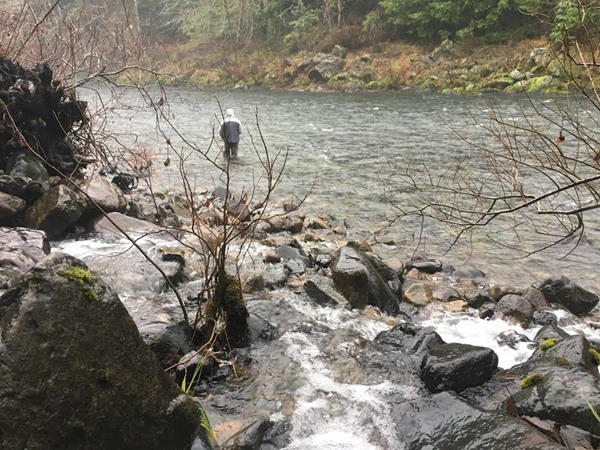 Recent king tides and a dropping river with a heavy pea soup stain gave us optimal conditions for finding a fesh steelhead or two as we started off on the first day. 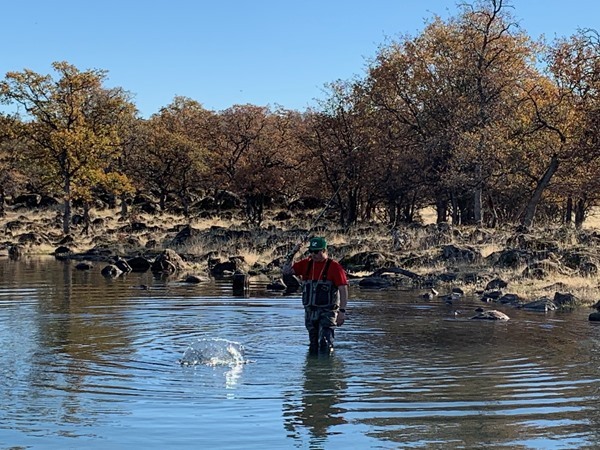 We floated the S. Fork Eel and had the river mostly to ourselves on our stretch. 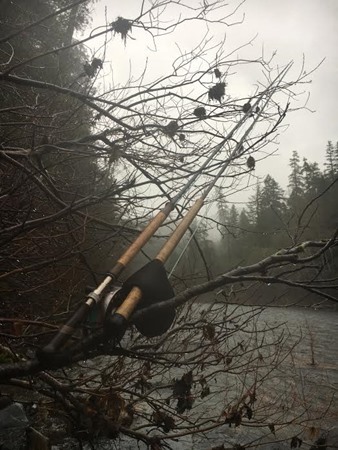 Despite good conditions we ended the first day empty handed, but the weather had been kind to us and Patrick and I were able to work on some casting techniques. All in all a great day to be on the water. The beauty of the old growth Redwoods that line the banks of the Eel never disappoint. The second day started with a soaking light rain and heavy cloud cover. 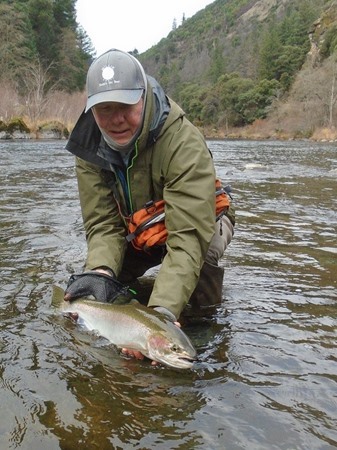 It was pure winter steelhead weather to be sure and hopes remained high that we would have an encounter or two. 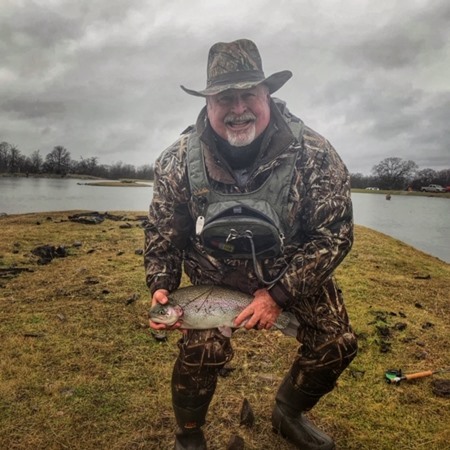 It was in the first run we fished that Patrick got grabbed and quickly found himself tethered to a mean little buck who put up one helluva fight before we were able to land him. It was a remarkable wild specimen, still clad in silver, it's fins translucent and glowing in the dim light. We were stoked to put it mildly. We fished hard for the rest of the day without another grab until we decided to try one more run as the sun was getting low over the Pacific. This time the grab came on the first cast and we both knew immediately that this was a hot fish. It drilled us. Patrick fought it up and down the run until finally it came off the line. No matter, it gave us a show neither of us will soon forget. 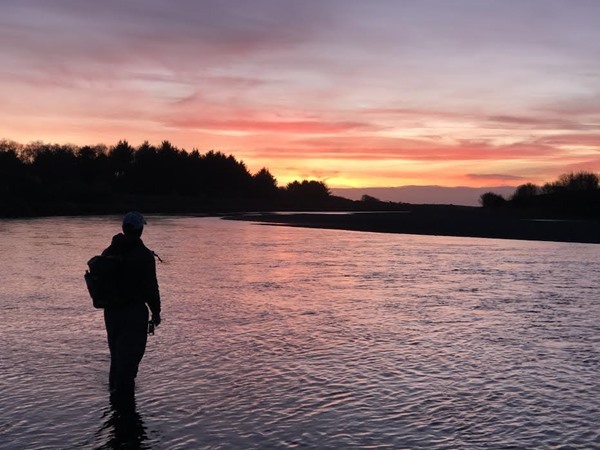 It was the perfect end to a phenomenal day of winter steelhead fishing. Fishing on the coast is in full swing. 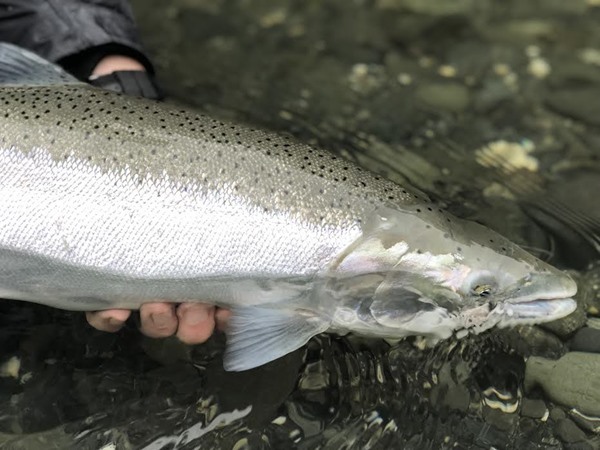 The Eel River is going to be in near perfect shape through the end of this week and will be the best bet for anyone looking to make the journey north along the coast in hopes of swinging up one of these elusive creatures. 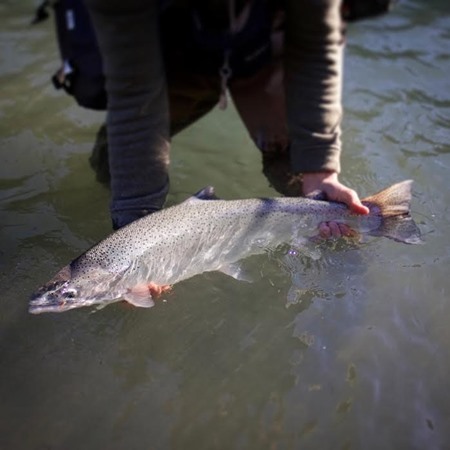 The New Year will see a few rivers open to fishing aswell, giving us anglers even more opportunities to make the connection. Rain is forecast to return to the North Coast by late next weekend and continue into the early part of the week. It could potentially be enough to blow out a few rivers, but also give a much needed bump to others. It should be an epic 2019 season. Happy New Years from the coast! 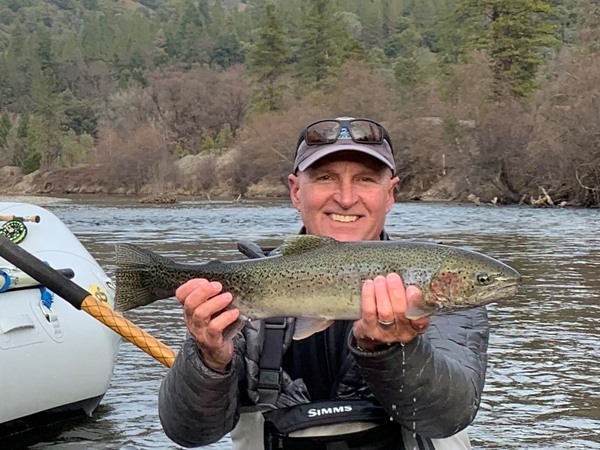 Here are some comments from guests that fished Eagle Canyon today:"Most of the fish were caught in the morning and in the evening with a streamer and intermediate line. I hooked some fish with a midge under an indicator. Hooked around 20 fish, landed around 16, broke off a couple while indicator fishing. All in all a good day. 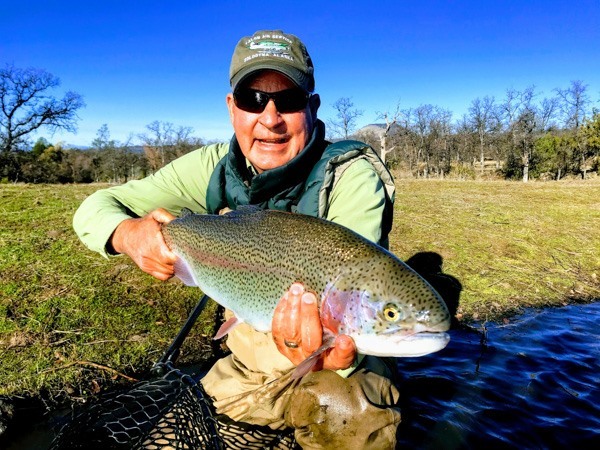 ""Caught many big, some huge, rainbows." 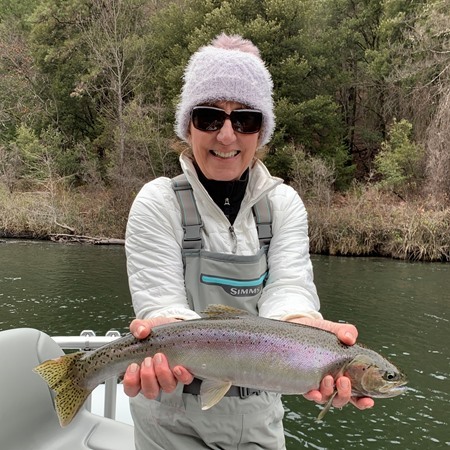 This photo was forwarded by one of our guests at Eagle Canyon yesterday.Linsey said "Thanks for a great day fishing today! 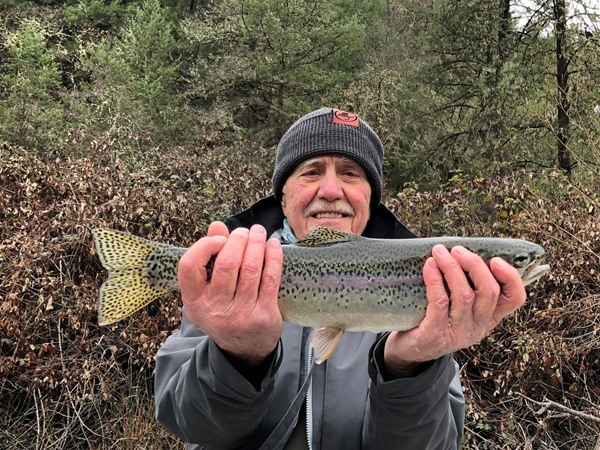 "Carl, another member of the group, said "Fishing was good,a little slow in the afternoon. Wooly Buggers, nymphs both with and without indicators. Fun day, thank you"
I spent a busman's holiday on the Trinity today with fellow guide Kevin Kay. 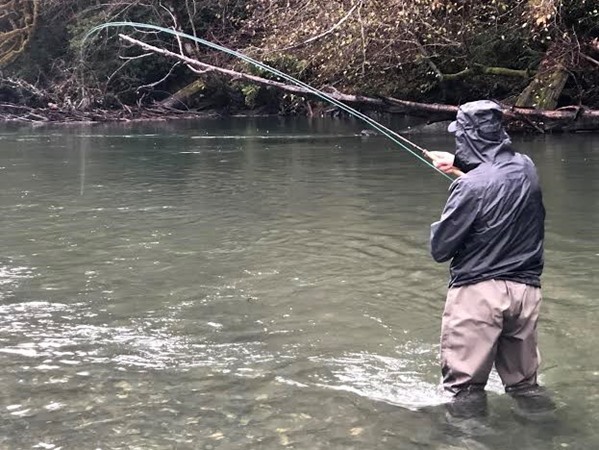 I managed to hook and land a 5 pound steelhead on my very first cast, so we were pretty sure I would be skunked the rest of the day. That's how it went until about 2pm, then my luck changed again. 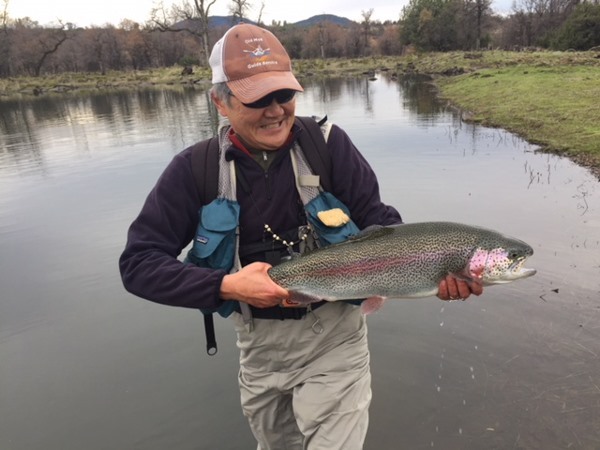 I landed a small adult wild fish on a rubberlegs, and then a wild 5 pound hen on a "garbage" fly that should have been in a 50 cent bin at your local fly shop. It was sort of like a psycho prince, but perhaps one tied by a kindergartner. In any case, it held together and fooled the big fish in the photo a little later on. We floated about 10 miles of river and only saw two other boats. 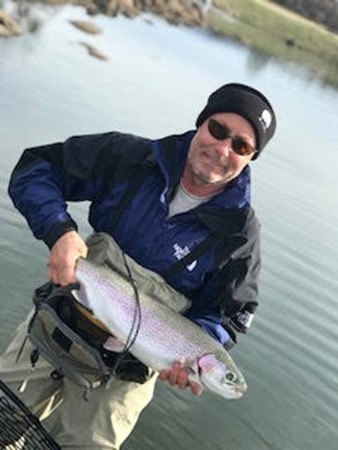 Great fishing and few anglers - my favorite conditions! I spent today on the Trinity with my very good client Pat. We had overcast skies and mild weather, which made for a very nice day. 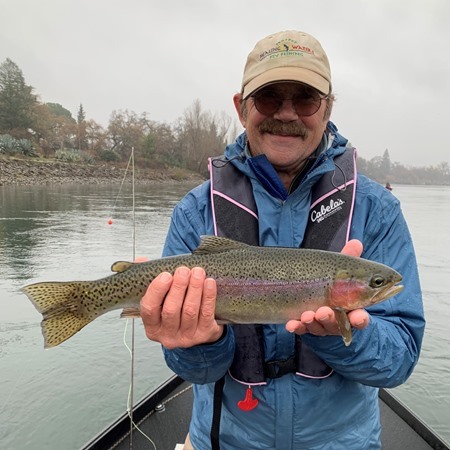 Our morning started slow, but we managed to hook several nice fish, including a really big fish that straightened the hook! Conditions are good, there are fish around and fishing pressure is pretty light. 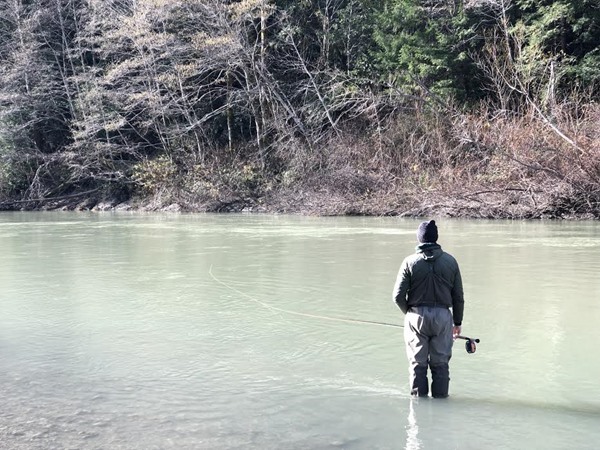 Rivers on the North Coast are seeing their first significant rise of the winter steelhead season. 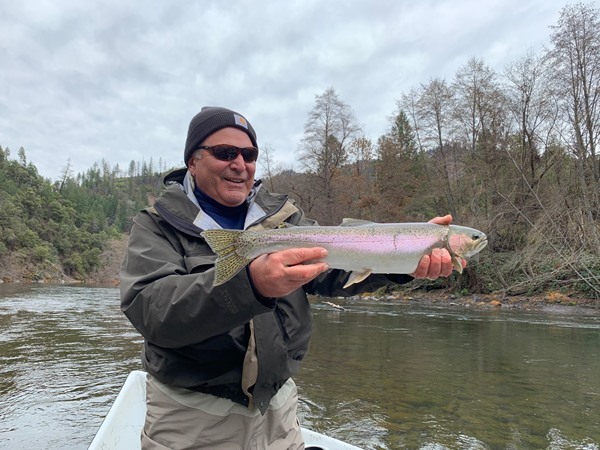 The stage has been set for all rivers on the Redwood Coast to see their first big push of winter steelhead with the increased flows. 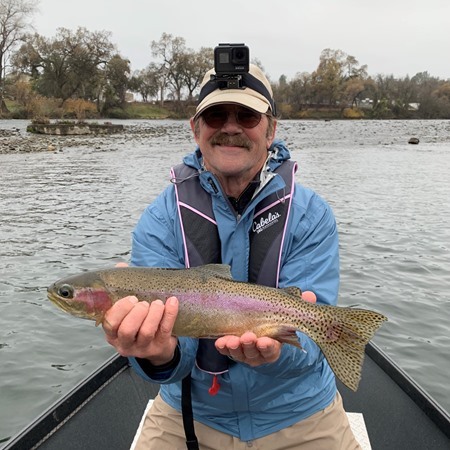 The Eel was fishing well before the rains, despite being low and clear there were reports of some very nice chromers being caught on the swing. With the recent rise the Eel will remain high and off color for the time being. I just finished a two day swing trip on the Smith with Jay from San Francisco. Although conditions were ideal for swinging one up the river was quiet. 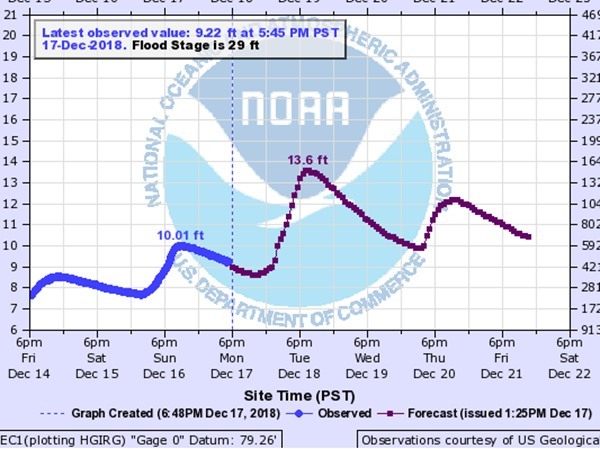 Even the gear boats were reporting tough fishing, but with the river projected to peak at 13.6 ft early this week we should see some salty fish making an appearance. December can be hit or miss for a shot at the first winter runs, but now that we're headed into the end of the month with plenty of rain on tap it's game on! 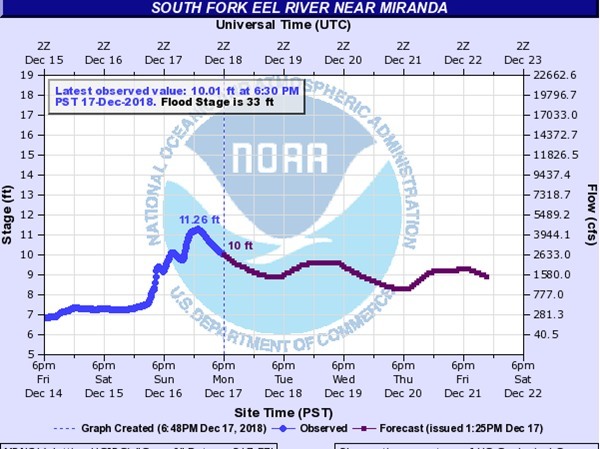 S.Fork Eel River project flows. Winter goodies ready for action. 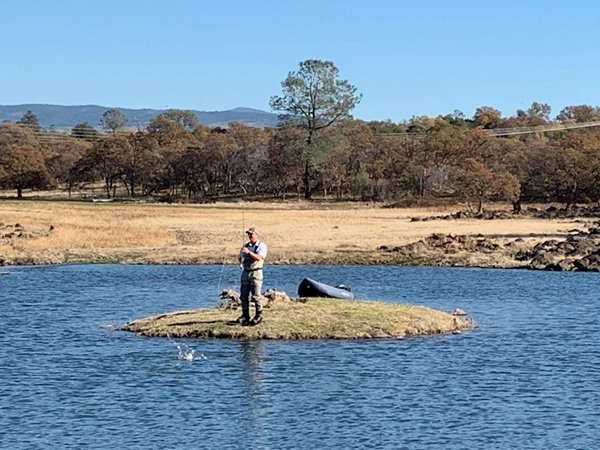 Peter Santley, Kevin Kay, Andreas Furhmann and I had the privilege and honor to guide a group of Project Healing Waters veterans on the Lower Sac today. 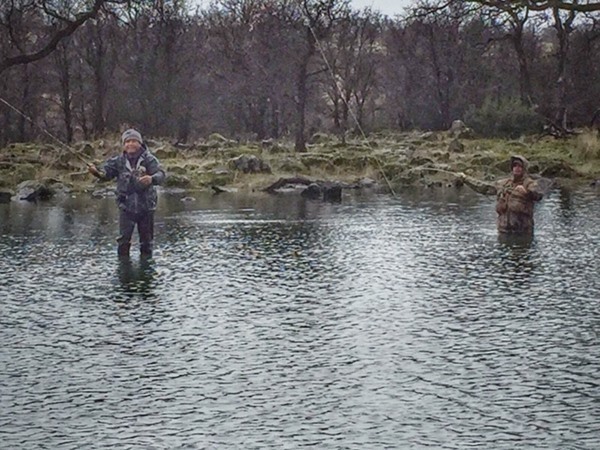 We lucked out with the weather, but the fishing proved to be a little challenging. 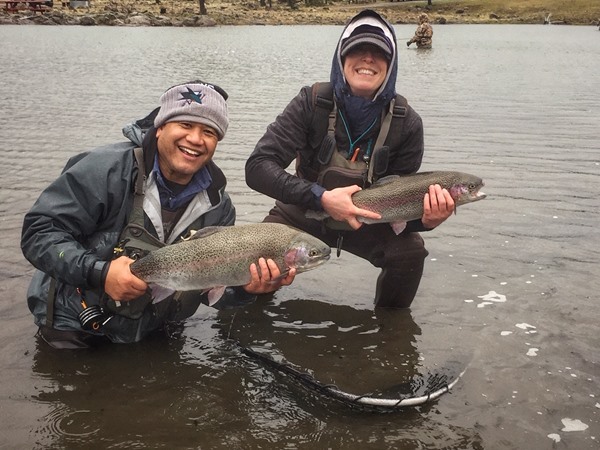 This was Patrick’s first time fly fishing and he landed two really beautiful fish, and missed a few others! Joe, Patrick’s mentor landed three really nice fish and missed a few others. 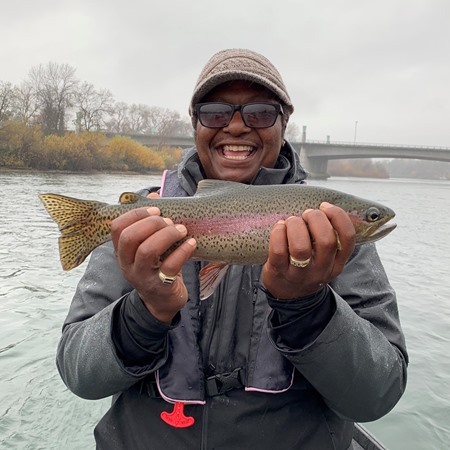 The other boats also hooked into fish and at the end of the day, all of the veterans had a great time learning to fly fish. Today was not a big numbers day, but the fish we landed made up for it! 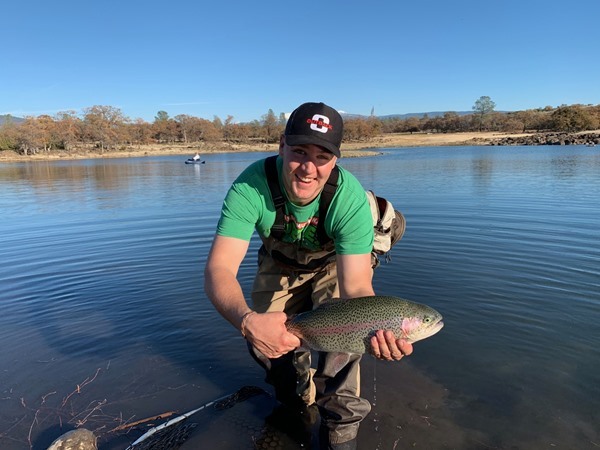 This is Patrick's first fish on a fly! 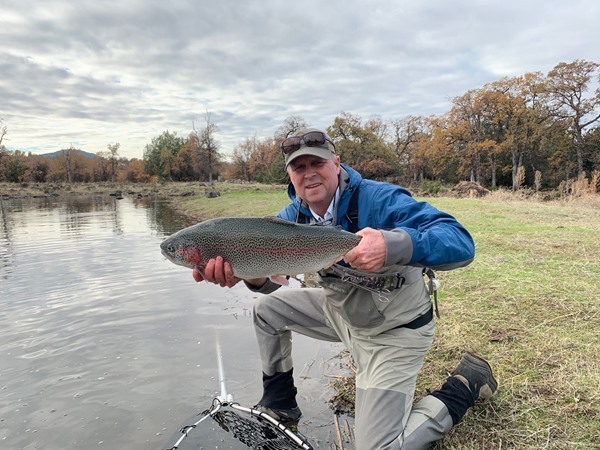 Patrick is "hooked" on fly fishing after today! I spent the last two days guiding buddies Steve and Ron from the Bay Area. My plan of staying away from other anglers worked great, except it also kept us away from most of the fish! 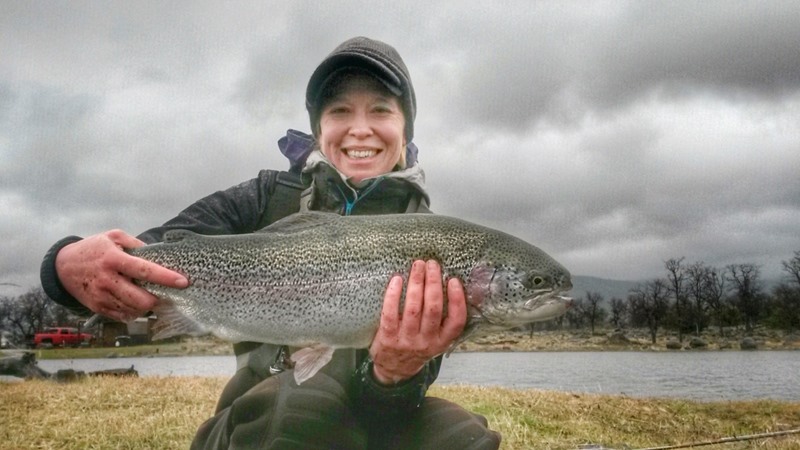 We saw no other anglers or boats on day 1 and managed to land a couple of nice wild fish. Day 2 was fishless except for a lengthy battle with one nice adult fish. The river is in great shape and I heard better reports from other areas of the river. Opening Day 2018-19 did not disappoint! Fishing was excellent most of the day and there were countless times when multiple anglers were hooked up at the same time. Our fish average 7.2 pounds this year so there are a lot of 10 pound plus fish to be caught. 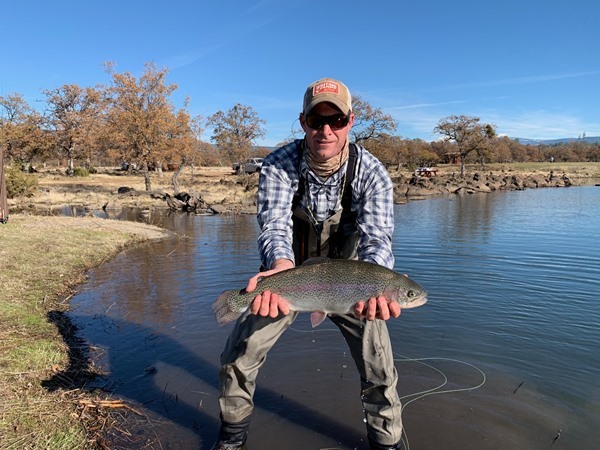 All of the action today was on medium to large streamers on moderate to fast retrieves.We still have room for 1-2 anglers this Monday Dec 10 and also Dec 27th.Our next open days for a larger group are Jan 2-3-4. I was on the Trinity today with guests Richard and his nephew Martin. This was Martin’s first time on the Trinity and what an experience he had! He hooked and landed a wild half-pounder within seconds of his very first cast. 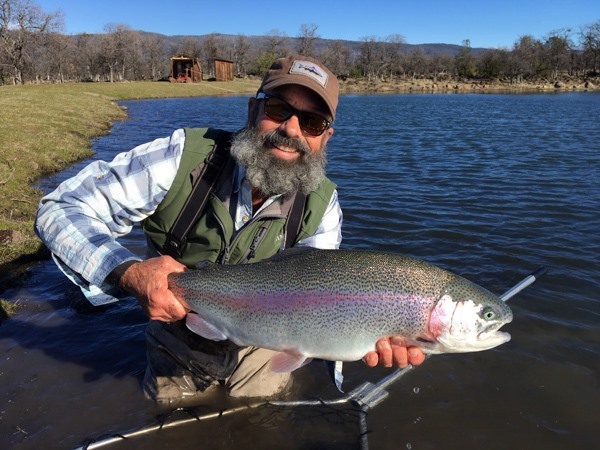 After backing up to the top of the run, Martin hooked and landed a beautiful wild buck on his second cast! 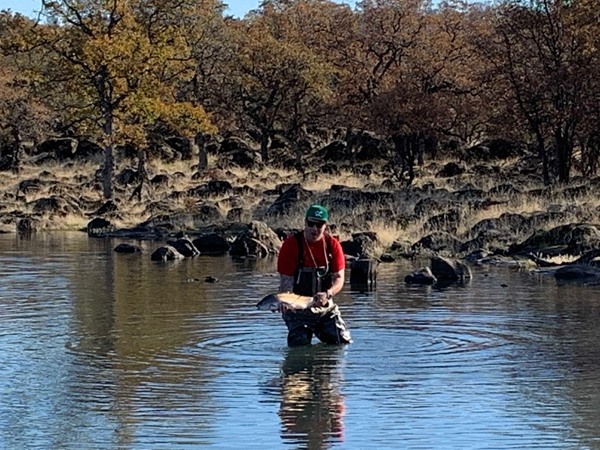 I tried to explain steelheading is NOT this easy – but after another few drifts, he hooked and landed another wild half-pounder! There was a lot of boat pressure today and despite working very hard, Richard and Martin were not rewarded with any more hook-ups. 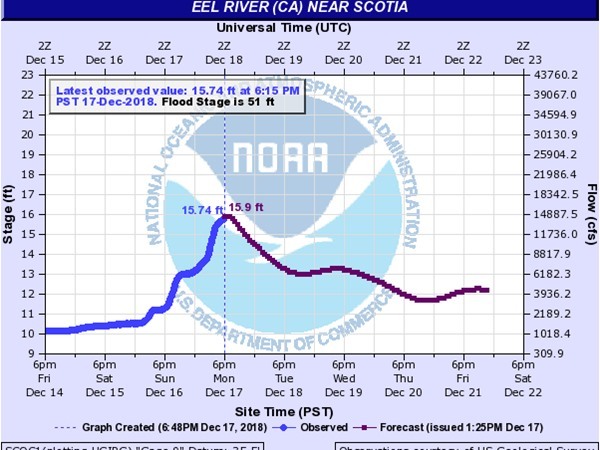 The flows are back to pre-storm levels. A weak storm is expected tomorrow afternoon, but the next series of storms will arrive late next week and look to bring some measureable rain. 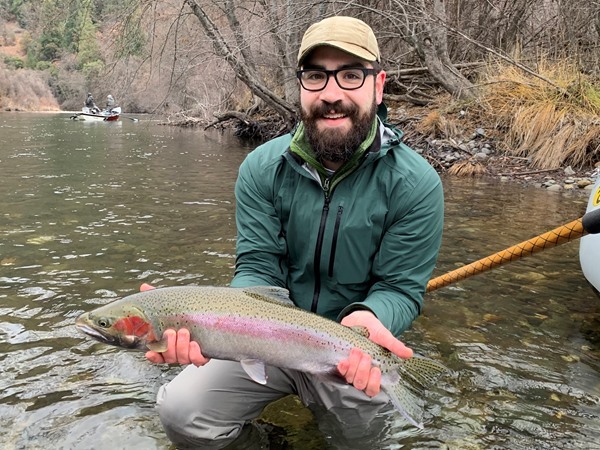 Martin with his first Trinity steelhead!